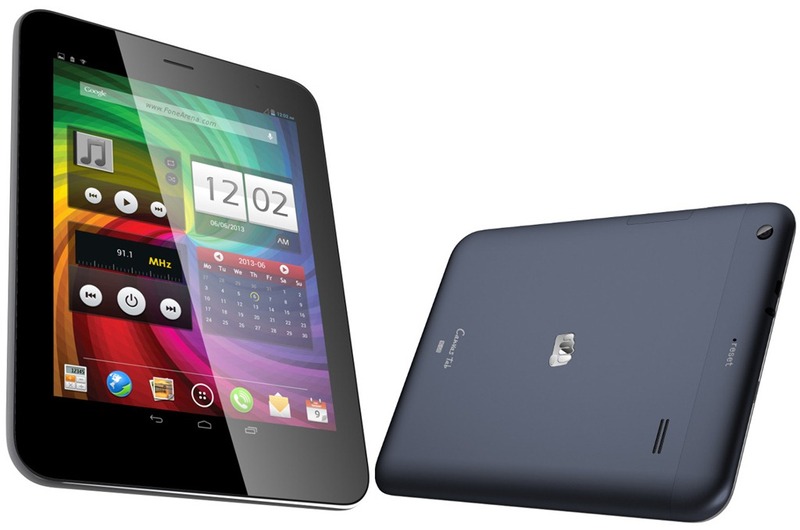 Here’s Micromax’s latest offering – the Canvas Tab P650. The device also happens to be their first tablet offering in the Canvas series, which until now was all about smartphones. The device comes with a quad core processor and a sleek and slim body around an 8 inch screen, which is reminiscent of Apple’s iPad mini. It will really be very interesting to see how well the device fares in the tablet market, which isn’t as tightly populated as the budget smartphone market in the country. The Micromax Canvas Tab P650 comes with a decent set of cameras as far as tablets are concerned. Also, it is a known fact that most choose to click pictures and video on their smartphones, so Micromax can afford a little sloppiness in this regard. The device comes with a 5MP rear camera along with a 2MP front unit. Although it would be unfair to expect this device to be as shutterbug friendly as the iPad mini, you can expect the 5MP main shooter to give you decent clicks, mainly because you would have low or non expectations from this device as far as cameras are concerned. The front 2MP unit should be good enough for day as well as night time, since it’ll only be used for video calls. The device packs a decent amount of storage – 16GB. This should give you enough room to install most of your favourite applications and space for storing data, like movies, images, etc. The fact that the device’s storage is expandable by up to 32GB is an added advantage. The device comes with an MT8389 chipset from, yes you guessed it, MediaTek. The MT8389 is a quad core chipset designed by the Chinese giant specifically for use on tablets. The processor is clocked at the same 1.2 GHz frequency as the MT6589 that is made for smartphones. Along with the powerful quad core processor, the device comes with 1GB of RAM which should make the device a more than decent performer. The P650 tablet comes with a very impressive battery of 4800 mAh, which means the device will be usable for more than 4 hours of screen on time. This should amount to about 1-2 days of real world usage, which is really impressive in our books. Micromax promises up to 5 hours of usage, up to 10 hours of talk time and up to 400 hours standby on the device. The device, as mentioned earlier, comes with an 8 inch screen with a resolution of 1024×768. Rings a bell? Yeah, the device comes with almost the exact display specifications of the iPad mini. As far as I’m concerned, the iPad mini was the most usable and the most practical tablet to have ever taken shape. The screen is large enough to enjoy movies, and at the same time, small enough to hold in one hand. This is where Micromax will benefit from the research conducted by Apple. Other features of the device include – Android v4.2, full HD playback, etc. The device looks very sleek and stylish, and for sure will compete against the iPad mini even when it’s the looks we’re talking about. On the connectivity front, the device comes packed with 3G, Wi-Fi 802.11 b/g/n, Bluetooth 3.0, GPS/A-GPS and 3.5mm audio jack. The device will have a head-on comparison against the iPad mini. The iPad mini came out a while back and is the most popular ‘small screen’ tablet out there, but the low cost of the P650 along with the fact that it comes with features such as 3G and Android OS might sway people into buying the P650 over the iPad mini. We have to admit that we are highly impressed with this offering from Micromax. At a time when most other manufacturers are keen on rolling out dual core devices in smartphones, Micromax have done well to come up with a very intelligent device in the form of the Canvas Tab P650. We feel that the device is the perfect successor to the FunBook series, and that it will do well in the market. Your review on Micromax Canvas Tab P650 is really informative and I am so much impressed with key features of this phone. Thanks for sharing useful information with us.